The majority of the information / items in this book are now in the Rory Feldman Collection. This includes the very significant 8 items mentioned on Page 11. To read about the importance of these 8 items, please read an excerpt from the book, shown below. "The following chapters have been gleaned from extensive research on the life of Howard Franklin Thurston, who billed himself as the "World's Greatest Magician" (from 1908 through 1936). The materials used include over one thousand letters, newspaper clippings, programs and program books, advertisements, books and all of the memorabilia associated with such a subject. It is my hope that this information will be new to the student of magical history and interest to all members of the Hocus Pocus fraternity. To begin with, let me mention the Grace Butterworth Thurston manuscript (authored by Howard's first wife) which she entitled "My Magic Husband, Thurston The Great." It was written in the early 1940's (nearly forty years after Grace and Howard had divorced) by Grace with the help of writer William L.Rhode. When Grace passed away in 1972, Mr.Rhode gave the manuscript to magician/collector Clayton Albright or Albany, New York. While visiting with Clayton in 1980, just before retiring for the day, he handed me the above manuscript. 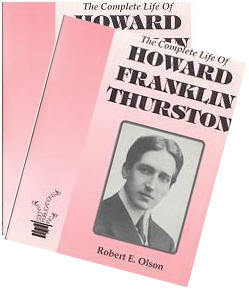 "This is the book written by Howard Thurston's first wife," he said. "Would you like to read it?" I spent a sleepless night reading the fascinating book! Then I talked him into letting me take the manuscript home, with the understanding that I would take notes, make copies of the pictures and accompanying documents, and use this information in lectures for the Magic Collector's Weekend in Chicago. These lectures were given progressively in 1981, 1982, and 1983. When Mr. Albright died, his books and the Grace Thurston manuscript were sold to a collector in northern New York. A list of these books and the manuscript were distributed to a few collectors. and Phil Temple of California purchased the manuscript, publishing it in 1985 under the title, "The Thurston Scrapbook". However, the documents and photographs were not included in that purchase. Copies of these documents include: 1) The letter Howard wrote to Grace's mother informing her of their marriage plans; 2) A handbill advertising Thurston and Texola, c1898, with a hidden letter on the back; 3) A photograph of Grace wearing a large hat; 4) A photograph of Grace without a hat; 5) A photograph of Howard; 6) A photograph of George white at nine years of age, with Howard pulling a rabbit out of a man's coat collar; 7) Grace's German passport dated 1901; and 8) A couple of rejection slips from international publishing houses. Many of these items are included in this work and are, for the first time, available to the magic fraternity. In April of 1982 I spent some time with the late Milbourne Christopher, well known magician, author and collector or magical memorabilia, discussing the Grace Butterworth Thurston manuscript. Milbourne had obtained, for his collection, a number of letters between Mr. Thurston and Thomas Chew Worthington III, a well known collector and Thurston fan from that era, and several letters written by Grace. Our meeting took place in Chicago. Concerning the Grace Butterworth Thurston manuscript, my wife would ask me, "How do you know this book is authentic, that it is not all a hoax?" In answer to this logical question, I compared the letters, handbills, photographs, and Grace's passport (from the trip to Germany in 1901) with Milbourne Christopher's collection of the letters - written by Grace, Howard and Mr. Worthington. They confirm many of the statements that Grace had made in the manuscript. A tone point Milbourne Christopher asked, "Do you know anything about the two-faced doll?" According to the manuscript the doll had been given to Grace by Howard for the Christmas of 1897. I was able to confirm the existence of the doll, and many other points, from the letters in the collection. Naturally I was pleased about this. So here it is; a step by step, year by year study of the life and work of Howard Thurston, "The World's Greatest Magician" of his era. We trust the reader will have as much fun reading it as I had writing it, and it will be judged as the definitive biography of this fascinating subject.